I love to use different fillings for the roulade. Here are two! Cut the roasted pepper, making one or two sheets, place thinly sliced mozarella and chorizo on top. Add salt, pepper and herbs. Roll into a roulade. Use string to tie it up. 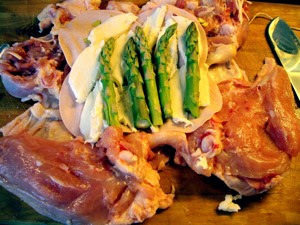 Spread mustard, cover it with the mortadella, the sliced mozarella and place asparagus tips on top. Add salt, pepper and herbs. Roll into a roulade. Use string to tie it up. Place in a very low oven (100C/215F), for four hours - and go for a walk.